I would like you to know how much expertise Les Skinner has gained in the many years that he has been trading as a fully qualified Bricklayer. 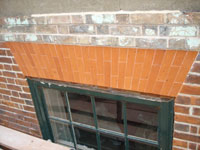 Les Skinner is totally committed to delivering the highest quality Brickwork. He can support your project by helping with planning as well as provide professional advice. 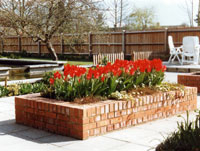 Over many years he has completed numerous housing projects as well as extensions and garden walls. 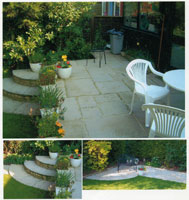 Les can provide you with the complete service to meet your requirements– Face block work – Alterations & Extensions – Repairs – Re-Pointing. He has also laid glass blocks which need special expertise and care both in design and fixing. He can support your project by helping with the design, planning as well as provide professional advice on safety and fuel efficiency for your project. His advise on the importance of the aesthetic look of your new fireplace, its balance and if it will suit your room and décor. He will produce a working drawing to assist his clients to see the finished article. Les can help with the design, as well as provide professional advice in dealing with the Local Authority in relation to building regulations and planning permission. As well as building new chimneys he also re-points chimney stacks, fits cowls & bird guards. His years of experience are used to identify problems when your chimney is not working as it should. Chimney inspections and smoke tests are also part of his remit. A further aspect that Les has developed is his ability to work with individual homeowners to provide a decorative feature that will enhance the home both inside and outside. His Bricklaying skills allow no task to be beyond his capabilities. 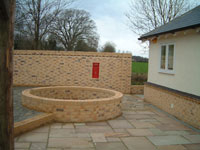 He also does specialize in restoration projects, where the need to create an effective marriage of new and old brickwork or stonework is so important and can be achieved with skilled artisan procedures which have been handed down from Master bricklayer to apprentice. 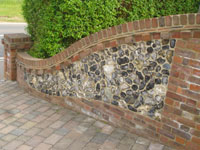 Les is very experienced in every aspect of the use of flint, including knapping – new construction -- matching to existing flint work – Conservation work – repointing --repairs. Working on the hard landscaping section of many garden projects over the years including patios and water features as well as a variety of decorative garden features. Les is also an expert in the use of stone in building, be it limestone, sandstone, course stonework and random rubble.Also he has built many fireplaces in stone. 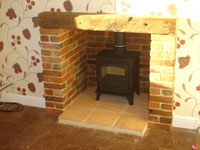 Les has completed many re-lining projects over the years as well as the supply and fitting of all types of wood burners and open fire appliances. He can provide professional advice in dealing with the Local Authority in relation to building regulations with all his work approved by the local building inspectors.